In Victoria, B.C. 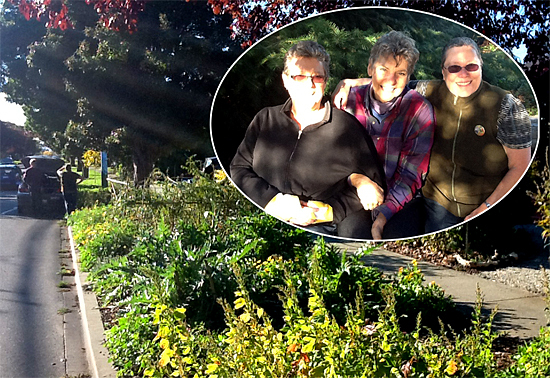 we visited Margot Johnston (L) and Rainey Hopewell (R), our guests in Claiming the Commons – Food for All on Haultain Boulevard” (episode 185, 2010). The boulevard garden continues to flourish. They’ve added a sitting area bench made from tree rounds. Coming: a book box for a neighborhood free library. We saw that a number of front yard gardens had sprouted up along the street in the past three years. Rainey impishly introduced us to the recently-opened corner “locavore” shop selling exclusively locally-produced food and products, and the coffee house/neighborhood hub. A sense of community along the street seems to be growing. Rainey and Margot’s circle of community goes beyond the street. 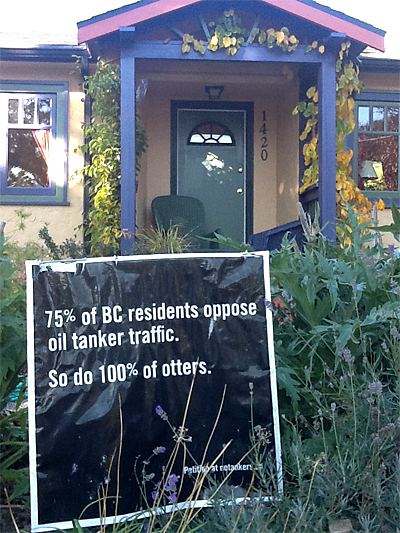 A sign in their front yard reminds us of yet more members of the Earth Commons to include in our circles of caring.